Termidor is America's best product to kill termites. Nothing else eliminates termites in and around you home faster. We can choose from dozens of pesticides and termite baiting systems, we recommend Termidor as the primary solution to eliminating your termites. Termidor is applied at very low rates. Typically, the active ingredient (fipronil) is just 0.06% of the solution, a concentration much lower than that of older liquids and less than most insecticides. Keep in mind, too, that since 1995, fipronil has been used around the world for flea and tick control on your household pets and on agricultural crops to protect food supplies. Termidor also binds to the soil, so there's no leaching through rainfall or irrigation. And Termidor has virtually no odor, which means you and your family won't notice a thing. Before Termidor was made available to American homeowners through Termidor Certified Professionals, it was subject to some of the toughest tests in history. For 8+ years, grueling USDA-Forest Service ground board and concrete slab trials in four states tested Termidor. At every application rate and every last location, Termidor proved 100% effective. Baits can take years to control a termite colony. Termidor begins working immediately to wipe out termites inside and immediately surrounding your home. Termidor is the most effective and fastest at completely eliminating termite populations  up to six-times faster than bait systems. Termidor is effective at very low application rates. Typically, when your pest control professional applies Termidor, the active ingredient fipronil will be just 0.06%. That's a lot lower than old-fashioned termiticides and less than most insecticides. Termidor is America's #1 termite defense against drywood termites and subterranean termites. No other termite treatment system of any type has ever achieved such a high level of termite control. Termidor controls Western Subterranean Termites, Eastern Subterranean Termites, Desert Subterranean Termites, the extremely destructive Formosan Subterranean Termites, and is also labeled for wood injection control of Drywood Termites. How can homeowners be sure that Termidor works? Termidor is made from a revolutionary new nonrepellent or "undetectable" chemical technology. In extensive trials across the United States and around the world, Termidor has proven itself to be the most effective and fastest at eliminating termites.. A level of efficacy that no other termite control system of any type has ever achieved. And, Termidor is proving to be equally effective in keeping termites from coming back. After over 10 years of testing, Termidor has proven more effective than any other product or treatment method against subterranean termites, including Formosans, in even the most challenging situations, climates and environments, results no other termite pest control product can match. Termidor cannot be directly purchased or applied by homeowners. Only licensed pest control professionals such as Arden Termite and Pest Control, who have taken Termidor Certification Training are authorized to purchase and apply Termidor. Additionally, the tools required to apply the Termidor, such as pumps and subslab injectors, would cost more than the price to treat just one house. How do you apply Termidor to my home? Our state licensed applicators will apply a liquid dilution of Termidor along the foundation walls of your home to create a continuous treatment zone. The application method is called "trenching and rodding," and may sometimes require drilling holes into the concrete foundation of your home for maximum protection. Your treating crew may also treat the interior of your home, depending on the extent of the termite infestation and damage. Termidor has consistently shown to provide 100% control of subterranean termites up to six times faster than termite bait/monitoring systems. Most homeowners see results within days. Yes, Arden Termite and Pest Control can offer termite protection to most any type of structure that is at risk for termite damage, including residential homes, churches, commercial and office buildings. How long will it take to complete a Termidor application? Each of our trained treating crews can treat a house in less than a day, offering your home or building termite protection that begins immediately. No, Termidor is an odor-free method of termite control. Termidor utilizes a unique action known as the "Transfer Effect" to effectively eliminate termite populations up to six times faster than bait systems. And, unlike older liquids, Termidor does not repel termites, termites can't smell, see or feel the insecticide, so they crawl freely through treated areas. When a termite eats or even comes in contact with the insecticide, it unknowingly transfers Termidor back to the colony on its body. 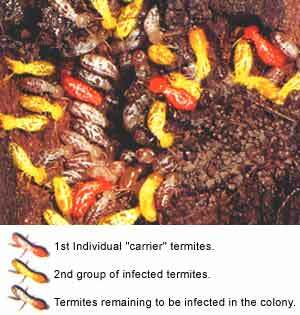 Every termite it contacts will transfer Termidor to other termites. Termidor is the most effective and fastest at completely eliminating termite populations up to six times faster than bait/ monitoring systems. Baits can take from many months to several years to control a colony. That's because many bait systems work by recruitment, in which termites must first discover a bait station and then recruit sufficient colony members to it as well. Only then is the termite control product added to the station. Plus, there's no guarantee termites heading for or already in your home will find the bait stations at all. Termidor starts working immediately. The cost of a Termidor termite treatment varies and largely depends on your particular situation and the treatment plan you and your termite pest control company agree upon. In the long run, a Termidor treatment plan generally will cost less than a termite baiting system and will provide more effective, longer lasting control. Call us for a free estimate today. Termidor is one of the most thoroughly reviewed termite control products in history. Termidor is registered with the Environmental Protection Agency and can only be applied by a pest control professional who has been trained in correct application methods. Termidor is incredibly effective even at low application rates. Termidor bonds to the soil in which it is applied, so homeowners need not worry about soil movement. In addition, Termidor's active ingredient, fipronil, is used extensively on food crops around the world and as the leading product for flea and tick control on dogs and cats since 1995.